Canada – Win! Win! Win! This giveaway is hosted by Home Jobs By Mom. We have done a few giveaways with them now. We truly appreciate their efforts. They can answer questions about the prize. Win! Win! Win! is only helping promote this giveaway. Thanks for participating and good luck! This is a super quick post to let Canadians know about the CRT Class Action Lawsuit and how most adult Canadians will qualify for the rebate. Up to $40 if you qualify for two. And who doesn’t? Monitors and TVs? Everyone had multiples. Price fixing was going on yet again. You must remember the bread class action. Hope you got your Loblaw Gift Card then. You can find all the information you need about the law suit and its history here. You will also find the easy, short form to fill out for your claim there. If you’re Canadian, take the time to check it out. Who doesn’t need $40? This has been in the news. It is real. You only have until February 22, 2019 to submit your claim. Thanks for reading this and let us know in the comments when you get your cheque. Busy day ahead working on the blog. Another of Win! Win! Win!’s contests, which is part of a Christmas giveaway hop, starting in two days. Plus, I have lots of work on a future collaboration myself and two other bloggers are planning. Lots of new plans coming soon, hope you return to see! Welcome to the Canvas Factory Giveaway! The Canvas Factory wants to make it easy and affordable for everyone to access online photo printing solutions. In addition to providing cheap canvas prints, they strive to provide top quality materials and flexible options. This giveaway is in no way endorsed, affiliated, or associated with Facebook, Twitter or any other Social Media Networking Site. You are not eligible if you have won a prize from this sponsor in the last 12 months. This Giveaway is valid in the United States and Canada and Entrants must be 18+ years of age to enter. This giveaway event will end at 11:59 PM (EST) 12/4/18. The winner will have 48 hours to email their information back to las93063 at gmail dot com or a new winner will be drawn, you may want to put this email address as safe as it could go to spam. The sponsors are each responsible for shipping of the above prizes. No blog associated with this contests are responsible for prize fulfillment. If you would like to be a sponsor in a giveaway like this please email Laura Smith at las930 (at)gmail (dot) com. If you take an entry you must stay following for the entire contest or you will be disqualified. Here is a list of contests Canadians can enter. They are mostly organized by other bloggers. Win! Win! Win! only helps to promote those contests. We are not responsible for their prizes. We are only responsible for Win! Win! Win!’s own contests. I was excited to be introduced to Sureway Digital Mall. An online Canadian jewelry company that serves the world. I love shopping Canadian whenever I can. They have a unique factory to business model that lets you order awesome jewelry from the comfort of your own home or anywhere on your phone at a great rate. Their passion for jewelry is evident from the quality of their pieces. Started in 2015 in Toronto, Ontario, Canada, Sureway Digital Mall has procured an eclectic assortment of fine jewelry. Many beautiful gold and silver baubles are available, as well as leather and beaded jewelry. Something for all, young or old or male or female, in their vast collection. Sureway Digital Mall has a large assortment of beautiful jewelry for both men and women. They manufacture and distribute unique customized jewelry, fashion jewelry, inspirational jewelry, beach jewelry, couples jewelry and they also have a nice selection of skull jewelry. That’s what caught my interest. Friends and I go to karaoke once a month and I’m the classic rock/glam rock girl. Joan Jett’s I Love Rock and Roll is my favorite karaoke song. I have sung that song well over a hundred times by now. Singing being used loosely, though. When I saw the Silver Plated Sugar Skull Ring With Roses at nearly 39 percent off I couldn’t resist. The ring finishes off my karaoke ensemble perfectly. It is so much fun to dress up and go out with friends and sing and dance. Okay, maybe drink a bit, too. You should try karaoke! It is a great stress reliever. The best part of all, the ring in no way looks like costume jewelry. It is beautiful. The detail is exquisite! Highly polished silver metal with inset silver skulls has two heart-shaped red crystal zirconia that are nestled around a rose gold flower. The red gems offer that radiant color-pop. I could wear the Sugar Skull Ring With Roses daily if I so chose to. Just I leave my rocker self for weekends. All my friends were gushing about my ring, when I wore it the first time. They were all wondering where I got it from; they hadn’t seen anything like it before and neither had I. I had a hard time deciding between Silver Plated Sugar Skull Ring With Roses and Sugar Skull Rings Set – Skull Wedding Rings. Both were on sale, but I’m super happy with my new ring and maybe will order the second ring next. Who knows! With so much unique jewelry I’m sure I’ll be back many times. Figuring out my ring size was simple, as well. Sureway Digital Mall’s blog has guides that describe in easy to follow steps the sizing for rings, bracelets and necklaces. No matter your taste, Sureway Digital Mall has something for you. Customer Service can help you find it. They will answer all your questions and get your order out to you, usually within 48 hours. She has always responded to my questions in a timely matter, and always with patience and a positive attitude. Sureway Digital Mall offers free shipping to anywhere in Canada, United States or Europe. They use the post office for delivery and always have a tracking number for you, so that you can follow where the package is on your phone or computer as it makes its way through the system. I received my order two days after it was sent. It was neatly wrapped in a cute box. They also offer hassle-free returns just in case you change your mind. More than likely you wont though, their passion ensures all production is meticulous and each piece of jewelry is scrutinized to ensure you are receiving detailed perfection. No doubt, like me, you’re a hard worker striving to be your best self, so we deserve to treat ourselves. There is always a sale going on at SurewayDM.com. So, you will be able to treat yourself often. You may as well do your holiday shopping there, as well! I am! Did you see those sales? And who doesn’t love jewelry! Sureway Digital Mall has many ways you can reach out or follow them on social media. Check back often to see what’s new! With full disclosure, I received compensation for producing this article. As always though, thoughts and opinions are my own. I was not told what to say. Please contact me, Marie, at youcanwinwinwinhere@rogers.com if you have any questions or concerns. Or just want to say hi! Please check out Win! Win! Win!‘s Other Pages. Current Contests at Win! Win! Win! This page is now here. Can you believe September is nearly 1/3 done? Time’s just flying by. Thanksgiving, Halloween and bang Christmas will be hear in no time. Which special holidays do you share with your family? Please share in the comments or message me with the above link, I’m always interested in learning. 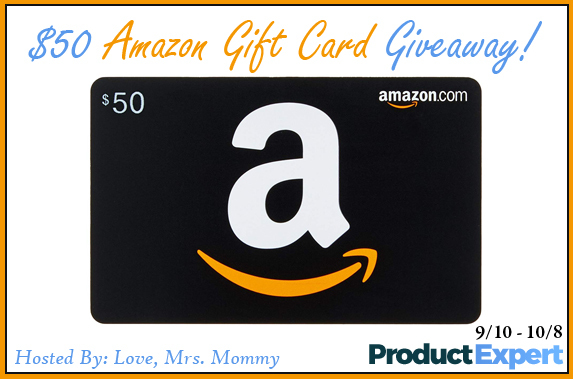 This giveaway is hosted by Love, Mrs. Mommy and the prize is being sponsored by Product Expert. We truly appreciate Love, Mrs. Mommy efforts. She can answer questions about the prize. Win! Win! Win! is only helping promote this giveaway. Thanks for participating and good luck!